Smith was born in New York in 1787. His parents, Chiliab and Mary Smith, moved to Mississippi when he was a boy. 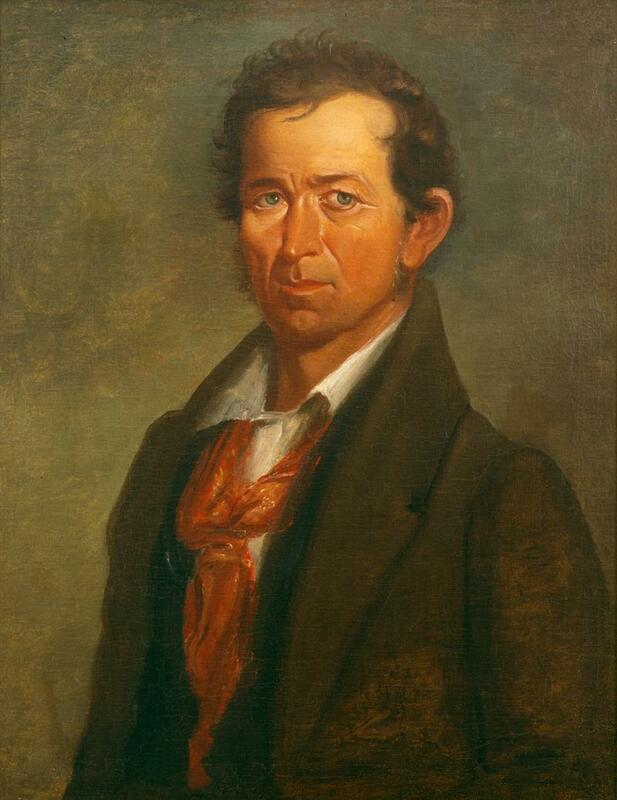 He first came to Texas on his own in 1817, but returned home for a time. He came to Texas permanently in 1821 and settled in Bexar (San Antonio), possibly near Mission San José. In the old parish church that eventually became the San Fernando Cathedral, he married Guadalupe Ruiz Durán of Guanajuato, Mexico the following year. Guadalupe was the widow of Jose Maria Vincente Durán whom she had married in 1812. In 1825 Smith settled in Green DeWitt’s Colony, a Mexican land grant situated southwest of Austin’s Colony (and a very interesting story of its own). The area near present day Gonzalez was selected as the capital. It is not completely known how he supported himself and his family during this period, but he was a good tracker and would have known the layout of the area well. By 1835, the Texas Revolution had begun. The Mexican Army commanded by Gen. Perfecto Cos was under siege in San Antonio. Smith was conflicted since his wife was born in Mexico and his family was living in San Antonio, so he did not wish to choose sides. Austin’s Army was encamped a few miles away and Smith, who had been away, requested and received permission from the Texas Army to try and visit his wife and family inside the town. He was reportedly refused entry and also attacked when he tried to enter the city to see his family, leading him to join Stephen F. Austin’s army. In the months that followed, Smith’s gifts as a spy, scout and tracker became apparent and he was eventually able to contact his family. He is credited for several discoveries leading to success in the battle of (Mission) Conceptión and the Grass Fight in which a Mexican supply train was discovered, all in the San Antonio area and was instrumental in the success of the siege. He was wounded while on top of the Veramendi House, in the same skirmish that Ben Milam was killed, and his actions were noted by Governor Henry Smith (no relation to Deaf Smith). The city was taken and Gen. Cos and his remaining forces were allowed to return to Mexico. A small garrison was left at the Alamo, first under Colonel Neill and later under William B, Travis. This fact became known to Gen. Santa Anna, dictator of Mexico, who had assumed command of the Mexican Army, and the General set out to retake the the Alamo. For a time, Smith served Col. Travis as messenger but eventually he was reassigned to Houston’s command. The Army had been reorganized under Thomas Jefferson Rusk and Sam Houston after Austin’s health had begun to fail him. Austin would eventually die in late 1836 at the age of 43. Houston sent Smith back to San Antonio in mid March to find that the garrison had fallen to Santa Anna. Mexican General Urrea had gone on to to defeat Colonel James W. Fannin, Jr. as Fannin and his troops attempted to retreat from Goliad. Most of the Texas troops and Fannin were all either killed in the skirmishes or massacred at Santa Anna’s direction after their surrender. After the defeat of Fannin, Smith served the Texas Army under Houston in various capacities as it regrouped, including training of recruits and performing various reconnoitering assignments. He was able to acquire significant items of intelligence leading to the discovery of the Mexican Army’s location and strength at San Jacinto. Houston assigned to him the task of destroying Vince’s Bridge, which served to cut off Mexican reinforcements and isolate the opposing forces in San Jacinto’s swampy ground. Santa Anna, General Cos and all of the key leadership of the Mexican Army at San Jacinto were either killed or captured on April 21, 1835. About a month later, Santa Anna would sign the treaties leading to the birth of the Republic of Texas. Following the defeat of the Mexican Army at San Jacinto, Smith remained in the Army for a while before resigning his commission. He later raised a company of Texas Rangers and served as its commander. It’s believed that his poor health forced him to resign as a Ranger and he moved to Richmond in Ft. Bend County. He died there at the residence of Randal Jones on November 30, 1837 and is interred at Calvary Episcopal Churchyard Cemetery. Guadalupe survived him another 12 years and is interred in San Antonio. Smith is celebrated as a hero among hearing impaired Texans for the way he persevered in spite of his hearing loss. A number of schools are named for him, as is Deaf Smith County in the Texas Panhandle. The Republic of Texas also honored him by printing his image on its $5 currency. “Texas Rising” implied that the Texas Rangers were already in existence before the Battle of San Jacinto. One source I found said that the term “Texas Ranger” did not appear officially in a piece of legislation until 1874. The same source credits Austin for forming the first “ranger” group in 1823 that served as a militia to protect colonists against marauding Indians. The Rangers predate the Texas Revolution, I believe, by over a decade, Ernie. I will see what I can find on the official organization of the group. Ernie, the oldest book I have on this is “The Texas Rangers” by Walter Prescott Webb. He wrote that there was an informal group mentioned in the records of Austin’s colony when it was dealing with Tawakonis who were hunting Tonkawas and stealing horses from the colony. Austin called a meeting around 1826 of the representatives of the six militia districts to provide for defense. Though there was no record that this force ever took the field, the conference agreed to keep a permanent force of 20 to 30 Rangers in service all the time. The next mention referred to in the book was in the minutes of a council called for by Austin, organized to direct the affairs of the Texas Revolution in 1835. On October 17, 1835, Daniel Parker offered a resolution creating a corps of Texas Rangers. There were later resolutions that set out the number of men, where they were to operate and how they were to be organized, but 1835 appears to be about the best date to use. Webb’s book was copyrighted in 1935 and the subtitle was “A Century of Frontier Defense” so it looks like the author was comfortable with a starting date of about 1835.
thought I’d drop back in and wish you a wonderful weekend! And you, as well. I really enjoy your blog. Dad served in the Pacific so I have heard a lot from him about those days. That’s what were all doing here on my site – honoring our fathers – you fit right in. We have oral history and are going back and expanding on it as we can. You have great period photos too. Great work! We’re two of a kind, we can compare notes. Sure. That would be great. Let’s exchange contact info offline.